Happy Mother's Day! And if you're not yet a mother like me and you desire to be one in the future just smile awkwardly, say Amen and keep it moving (like I have been doing) :P.
Mother's Day is a great time to reflect and show thanks to anyone who has shown you motherly love whether biological or otherwise. Because being a mother is more than just biology. I thought it would be cool to look at some mothers in the Bible and some lessons I got from them. We all remember who she is right? If not let me refresh your memory; she was the wife of Isaac and mother to Jacob and Esau. Not much is said about how she was as a mother except for the fact that she did show favouritism between her two children. She wasn't the only one however as Isaac was in on it too but my focus will be on Rebekah. I don't think it is fair to say that she was a bad mother because of her favouritism but I think we can agree that showing favouritism when you have children is certainly not a good thing. Why? It can breed a number of insecurities within children with the less favoured one not feeling adequate and desperately trying to get your attention at all costs- even if it means misbehaving. Favouritism does not have to be vocalised; your actions can show it too. Celebrate the differences amongst your children and get to know them for who they are and now who you want them to be. You may have come across adults that still lament the fact that their mum preferred their younger or older sibling to them. It really is not a nice thing to do and the only time where favouritism between your children will work is if you have an only child. We do not hear much about Herodias either but what we do hear of her in the Bible is not good; she tells her daughter to request for the beheading of John. In the passage Salome does not question her mother and it seems as if such a request is nothing out of the ordinary. Now we don't know the ins and outs of their relationship but it could be fair to assume that Herodias has told her daughter to do other bad things before either by speech or by example. She clearly had no respect for those called by God such as John the Baptist and this was passed on to her daughter Salome. Of course it can be argued that after a certain age one should reach the point where you know right from wrong and Salome chose to listen and do as her mother instructed. What we should realise however is that mothers have an immeasurable amount of influence and if it is not used wisely it can lead to destruction. Children enter the world with a blank slate and as a mother you play a part in writing what will form their core values and the like-at least up until 18. Herodias did not use her influence well and also did not respect those that God had called. How do you use your influence as a mother? What are you showing your children? How do you speak about the things of God around them? Do you even speak to them about it? It starts from when they are babies even all up until they grow up; children learn more by observation than what you tell them so if your words do not match up with your actions in a positive manner then you run the risk of being seen as a hypocrite. I won't dwell too long on this and for more info check out my post that is all about Hagar. She is sent away in the first place for mocking Sarah because she is yet to have a child. She's not away for too long as she is told to go back and be submissive to Sarah. All seems well for a while until Ishmael grows up and he too follows her footsteps and mocks is half brother Isaac. This is just too much for Sara to bear and she orders that they be sent away- and for good this time round. The fact that Ishmael also mocks suggests that it is learned behaviour that he most likely learnt from his mum. What are we teaching our children? Most importantly if they have gone to school or elsewhere and have picked up bad habits are we overwriting it by reminding them of the right thing to do? This is similar to that of Hagar in the sense that she would torment Hannah because she was yet to have a child. I wonder what kind of atmosphere this created at home and what her children would have witnessed and learnt from this behaviour. How you speak of others around your children matters. Are we speaking with grace or are our words cutting and not conducive to building anyone up except self? Hannah dedicated her son to the Lord both in word and action too. It is not enough to just go to church and have your child be dedicated- our lives should continuously be dedicated to God in all that we do. Whilst it may not mean physically leaving your child in the house of God it does mean leading by example and training your child in the ways of the Lord. If you ever want to follow a blueprint of the type of mother-in-law that one should be look no further than Naomi. She took Ruth and Orpah as her own even after the death of her sons. Orpah decides to leave but it is not due to her being a bad mother in law. She leaves for her own personal 'gains'/ reasons. God forbid that a spouse should pass away, many would follow the route of Orpah simply because they've had a strained relationship with their mother in law and now that the link is seemingly gone they also decide to distance themselves. Some of you demand things from your daughters in law that your own child won't do for you. Some of you are negative from the beginning and just see nobody as good enough for your child. Naomi was not like that and really took Ruth under her wing and watched our for her as if she was her daughter- because she was. It is not recorded in the Bible that Ruth or Orpah even had children and so Naomi was not a grandmother yet. In some cultures or families that may have caused an issue but Naomi was not led by culture- she was led by God. How has your year been? Great, abysmal or a 'let's not talk about it' kind of year. Either which way you're alive! At least you must be to be reading this so that counts for something right? As usual I am back again with my annual end of your blog post. I've been a bit quiet on this blog and that is because I have been discovering myself offline which will reflect in due time online. 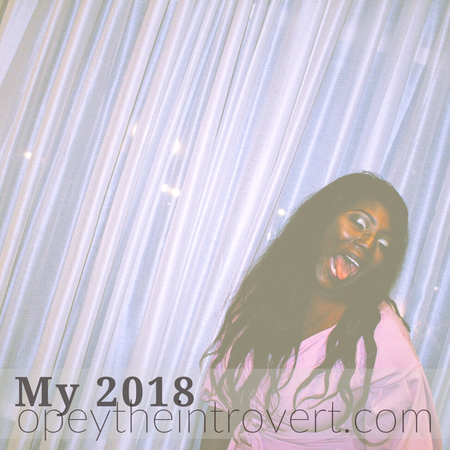 So, what were some of the lesson I learnt this year? Hmm. Quite a few but I will try to keep it short and sweet. If God has given you a word hold unto it for dear life. I touched on it briefly in my graduation post but I will speak on it more here. The word that He gave me has and is still seeing me through. Life post uni was interesting to say the least. September was the best and worst month of my life. I was job hunting like crazy and my faith was stretched like never before. So many other things were running through my mind at the same time and nothing seemed to make sense. What do I want to do? What do I not want to do? Can I merge my creative talents with other things? Should I just stick to what I know? And so on and so forth. I literally cried every single day in September. I remember meeting up with two of my girls early October and saying that this was the first week where I had not cried so that was a testimony in itself. It was in this month however that I got to know God more than ever before and really understand what it means to trust Him. Totally. I can confidently say that the quarter of the year has been my favourite and that is all down to the growth I experienced in Him. I thank God that He did come through for me and I got a job. I'd be lying if I said I still understand where everything is leading but things are becoming a lot more clearer and I see how He is piecing the puzzle together. So yeah, hold unto God and hold unto His word. It works. Again, this last quarter of the year I really learnt more about who I am in Him and what it means. I learnt that my identity is not tied to any role I have, anything I own or what people say about me; it is what God says about me that matters the most. We are all unique and the plans He has for us differ. We know this yet we still watch the time of others. Why? The timings of our life are not the same and we are all in various seasons. I learnt (afresh) to stay in my lane and mind my own business. So no comparison, no asking 'Why me', no self pity. Instead I choose to keep my eyes on Him and trust that His timing is best. When you know your identity in Christ you are secure. Insecurities have no choice but to leave. Whenever they come up you remind yourself of who God says you are. When you know your identity in Christ you do not try to emulate anyone because you are you and they are them. I could go on but I will save that for another blog post. Good friendship that is! I have learnt the importance of surrounding yourself with like minded and good people that will encourage you. Most importantly I have seen the benefits of Godly friendship and the unique accountability that it brings. Whilst it is great to be surrounded by such people it is more important to BE that person. It was also the year that I did my first blog related event which was pretty cool. Here is to many more (maybe, possibly). Going forward and into 2019 I am determined to use my time better and to live fearlessly. All in all 2018 has been a very good year for me and foundational in many regards. Whilst I do not know what 2019 has to offer I do know that God has gone before me and because of that I walk in that assurance. Another year another birthday. This time round I turned 24 on 1st December. Looking back on this past year and I am so grateful for everything. What a difference a year can make. I can honestly say that this year was my best so far and the lessons I have learnt have been pivotal. This was also the year that I graduated and travelled quite a bit too so all in all 23 was quite colourful. I really am excited about this new year and there will be changes- some that you will see on this blog in due time. 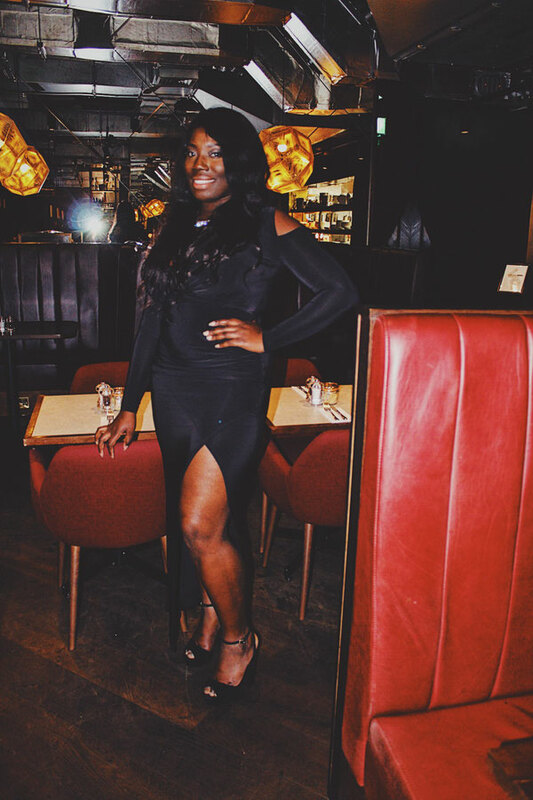 As my birthday was on a Saturday I decided to make it a weekend affair starting off with going to VQ Aldgate, a 24 hour restaurant on Friday evening with two friends. It was a pretty cool way to enter my birthday. Early on in October my youngest sister turned 13 and it took me back to when I was 13. It's hard to believe that she is now beginning her teenager years. Time flies. I decided to write some advice that I wish I knew when it was my time but those are some of the cons of being the oldest. You go through the challenges, so the others don't have to. Sometimes. In any case here is some advice to my sister and anyone else who is on the cusp of their teenage years. Ok ok, you will not know yourself totally as you are still very much at the stage of growing not just physically but emotionally too. You are still in the process of becoming. Still, knowing yourself means knowing your likes and dislikes. With time this develops into forming your own personal values. It sounds like a lot right now but as you go further into your teenage years (and beyond) it will put you in good stead. At first they will be based on what your parents like or dislike as you are being raised by them. Over time however it goes beyond that and you form your own set of beliefs. It is important that you do know yourself however otherwise society will tell you who you are and that seldom ends well. I'd be lying if I said peer pressure won't happen and guess what? It continues up until the day you die. I will say however that there is something about it happening during your teenage years that can really derail you for the worst if you are not careful. Unscrew. Why? People around you will try to nail their desires of what they think you should be doing into your mind but you have the power to unscrew it. You really do not have to do anything just because 'everyone else is'. You are you. They are them. The only time they should cross paths is when it is for a good purpose. Otherwise? Stay in your lane. It can be lonely but it's better than being surrounded by false expectations. The saddest thing is that you will find some of your friends falling victim to this and you can see right through it. It becomes obvious in the playground when interacting with peers. Do not ever feel pressured to do anything you do not want to from friends to guys and anything else. Too early to mention the latter? I'm not naïve and I know the types of conversations that go on amongst teens because I too was privy to such in my time. It does not matter if all your friends are doing something, if you don't want to do it then don't. It ties into number 1; knowing yourself. When you do the opinions of others become irrelevant. I know that it's becoming increasingly hard to but please do hang unto your innocence. Innocence does not have to mean naivety. I mean innocence in the sense of not rushing to be grown up. You have the rest of your life to wear make up (if you want) and also trip over yourself in heels too and all the other things you may 'deem' as grown up. They're not going anywhere and they will be waiting for you once you pass the age of 18. I know that social media has fast tracked this process and you're exposed to so much more than I ever was at your age but it is ok to shut it all out and just be. Do not be naïve however because of a truth the world can be a wicked place and you need to know that not everyone has a right moral compass- if any at all. Innocence is also not ignorance and you should be clued up on what is happening around you but you don't need to know everything. Not just yet. But when you do know I trust that you will have the confidence to not allow the ways of the world to corrupt you. 4. Hormones can be an absolute killer! By now you must have come across some of my old facebook statuses. I was something else wasn't I? I really was in my 'feelings' at times but that's the thing with hormones at times- they tend to amplify what you are already feeling and make it seemingly worse. There are times you will feel like the whole world is against you but that it is really not the case. It's just your hormones messing about with you because, puberty. I'm not saying don't feel. Feel and have emotions. Just know that if you're feeling even more terrible than usual and with no reason for it then its hormones. Definitely hormones. I cannot stress this enough. You do not realise it now but the memories you are making right now will be hard to erase later. That can be a good or bad thing depending on who you were and how you treated others. People don't forget who the nasty ones were back in school. If you were a bully then you will always be remembered as a bully in years to come. Even if you change, the actions that you did to others in the past are still there and the chances of everyone you have wronged in the past coming across a new and improved version of you are slim. Is it the end of the world then if you were a bully then and you change as you grow up? No. But you must realise that nobody owes you another chance to prove yourself. So, be a good person. Treat everyone with respect. Everyone. Not because of what you can gain but just because it is the right thing to do. Sorry to burst your bubble but it will happen. People change and some will move schools so it is inevitable that your friendship circle will differ as you grow up. It is not a bad thing and is a part of life. Over time and well after you leave your teenage years the number of people you still consider as friends from secondary school will reduce. I used to roll my eyes when people said this to me then but as I got older I saw it was true. The ones that really matter stay and don't leave. Try as you might to shake them off they refuse to go because they want to maintain that friendship. You may not speak as often as you once used to but they are solid and often become the backdrop on which the other friends you acquire in later life now join. Make sure to never take them for granted in the process of discovering the 'newness' of meeting others. It can be tempting to get carried away with getting to know a new friend and forgetting 'old' friends but who says the two cannot coexist? On the flip side make sure to never hold unto a dying friendship just because you both have 'history' together and you knew each other since secondary school. Ultimately it is about those who are there for you and that's it. Real recognises real, not based on the years of friendship but the depth of it. You will find boys attractive and that is perfectly normal. You might be tempted to want to act on the attraction and whilst it is deemed the norm I wouldn't recommend it. For starters they rarely lead to anything and it often ends up being used as a way to while away time. Don't get me wrong, childhood sweethearts exist but it is not the story for everyone. Iron sharpens iron. If God is indeed our friend and our God, He should be able to sharpen us. Have you watched a video of a blacksmith beating iron into submission? The beating is not meant to cause pain or damage but rather to refine the object. Now, imagine that you are the iron and God is 'beating' you into submission. Painful, right? Thing is, we are not objects but beings with flesh and a heart that beats and sometimes it feels that God is 'stomping' on our hearts, our wills and our desires. When iron sharpens iron, extreme heat is involved. The iron object is exposed to fire. If you were to touch the object then you would burn yourself. A thing that can be learned here is to grace people when they're going through the fire. Often times when we meet someone through the fire it is not always a true reflection of who they are. They may be temporarily embittered or angry at God and the world and this can reflect in their interactions with others. Try not to take it personally but rather lift them up in prayer. The same fire that can refine a person can also cause scars if care is not taken. May the latter not be our portion in Jesus name. Depending on the exact specification of what is required, the iron is then twisted and moulded into the final form. This is because iron, pure iron anyway, is malleable; it can be bent into what is required of it. Some of us may say that we are iron but that is not 100% correct as we are an amalgamation of various metals thus rendering us to be composite materials. This could be pride, jealousy, unforgiveness and much more.How then can we be sharpened? We end up being resistant to the process and what God had desired to use to mould us to be better Christians instead mars us and we become embittered towards Him. Are we going to allow God to mould us-completely? Or are we just going to go through the process in vain? Iron sharpens iron, yes but we have to allow it to and a part of that is embracing the process, the fire and the pain. God does not force anyone and it is possible that He stops during the process due to our refusal to be bent and that in itself can leave us deformed. When we see fellow Christians sharing their testimonies it is because they have allowed God to sharpen them. Will you do the same? There are multiple seasons of sharpening in our lives and the end of one that culminates in a testimony can sometimes mean that another season of such is on its way. Maybe you're going through the fire right now and if so then you are not alone because I am in it too but most importantly God is here, in the fire with us and provided that we submit ourselves to Him then we will come out refined and moulded into what God has called us to be. I came across a verse recently that really resonated with me and it is one that I am still meditating on but I have some thoughts on it now which I will share below. 3 Let nothing be done through strife or vainglory; but in lowliness of mind let each esteem others better than themselves. The first thing that caught my attention is that we are to see others better than ourselves. What if you earn more than them? What if you have more influence than them? What if you're 'better' than them. Well, it does not matter, not in the slightest. "As he thinketh in his heart so He is"
If you think you're a failure well, surprise surprise you will be one. If you think you are successful, you will be a success. With this in mind watch what you think and meditate on. It is much more than 'positive' thinking because what happens when you don't feel so positive? All the good thoughts from before go out of the window. When you possess Christ centred thoughts about you it will eventually shape your identity and there is simply no room for insecurity. This also happens when we are honest with ourselves and our pasts as whilst we cannot control what is said to us, we can choose to imbibe it or discard it. It can take time to renew the mind and one thing I am learning is that it is a continuous process. It does not mean that you will not have momentarily lapses or flashes of doubt but quickly counter them with God's promises over your life. With all that being said and you daily working on renewing your mind in Christ, you will find it easier to regard others as better than you. There will be no need to flinch or recoil because you know that your identity lies in Christ and not in your earthly accolades (which are not bad too). There will also be no need to see others as competition too. The saddest thing is when Christians see fellow Christians as 'competition' as if we don't have a common denominator- God. 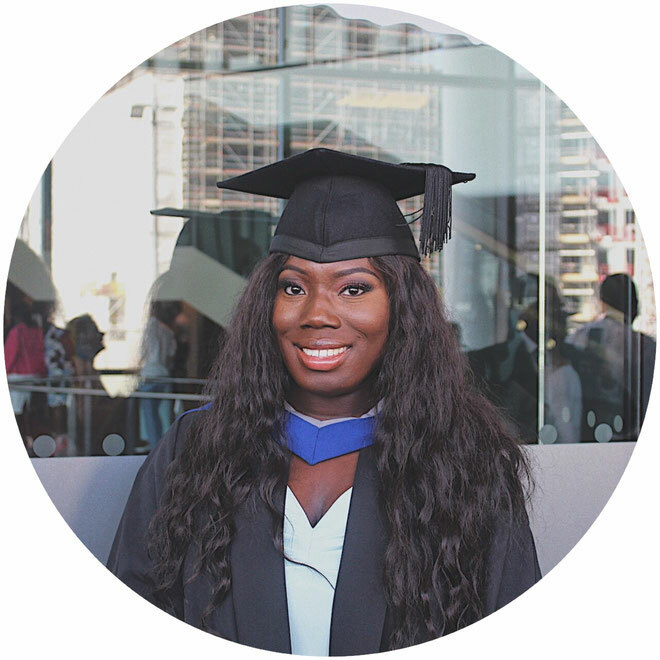 On Tuesday, 24th July I graduated from University with a First in Hospitality Management and Food Studies but let's take it all the way back, to the beginning. I'd decided to take a gap year for a number of reason but also clarity about my next step in life. I was not happy with my A- Level results and I decided to scrap the initial path that I had initially thought I would tow. I also used the year to redo some modules (in my own time) which to be honest ended up being a waste of time in hindsight but hey, at least I tried right? In addition to that, I used the year to get my first job which happened to be with a hospitality agency as I was still also thinking about whether university was for me or not. Early to midway through the year I realised that I do want to go to uni but I still wasn't sure what I wanted to do. I had applied to a few unis during this year as I chose not to the final year of my sixth form. Let's just say that it ended up being in vain as I did not meet their requirements and ended up being in a place that I never thought I would be in; clearing. For as long as I remember I'd always been fine academically. I'd never struggled to attain good grades so my subpar A level grades really got to me in a big way. Knowing that I definitely wanted to go to uni but having to rethink the course I wanted to take put me in a complex conundrum. There were some things I knew I could have studied but I wasn't too keen on studying my passions (Writing and English) for three years as I wasn't sure if I would enjoy it. 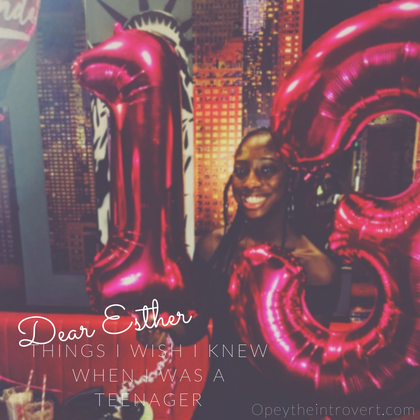 I thought about my experience during my gap year and my work; I'd found it to be alright. I didn't know much about hospitality but I thought that the devil you know may be better than the one you don't know. And so my journey into hospitality began. It's actually so weird how God works at times because for as long as I can remember (around my early teens) I'd had a desire to have my own restaurant and other interests surrounding food. I actually did not know what to expect at all so first year was a real all over the place experience. I did however say to myself that I refuse to be miserable about life not seemingly going the way that I had expected it to go and I made a concerted effort to get stuck into University life. I was not going to be a miserable person who moped about with a 'woe is me' countenance. After first year I realised that I enjoyed it much more than I thought I would which was great. I wish I could say that this made second year easier but it seemed to be the beginning of a whole new set of different challenges. A placement year was a requirement for the course and our uni did it so that we started in January as opposed to the start of the academic year. There were ways to get out of the placement year but I unfortunately did not meet the criteria. I was really upset about this as it seemed that I would now be graduating much later than I ever thought or expected I would. I was so self conscious about it and whenever people used to (continuously) ask me about final year based on their assumption on when I should be finished with uni it really irked and irritated me. The worst is when they would still continue to go on and on about it and it was the main reason why I didn't want to do a placement as I wanted to leave uni at a more 'socially acceptable' age (so ridiculous looking back). I had to get to the point where I was content in where I was in life and knowing that I was exactly where God wanted me to be. I'll rewind to late 2012 when God gave me a specific word which has been, and continues to be a comfort and which saw me through university despite various challenges. Now, it's placement year and His word is tested because that year started off an absolute shambles. I'd gotten a placement, later than expected at a place that seemed promising. A week into my placement I was dismissed and for no tangible reason either. I couldn't believe it and I was upset about it for a long while which hindered me looking for another placement or place to work . Most companies had closed their schemes by now so I had to apply for a regular job within the hospitality industry. Soon enough I found one at a place that most would consider great but it was far from the reality. For starters my contract was changed last minute from full time to zero hours which was a major disappointment. Zero hours are really not ideal especially when you have a certain number of hours that must be completed in order to pass the placement year. The only thing that made it palatable was the fact that I was working everyday so that really helped. Unfortunately the atmosphere at work was horrible and the company culture left much to be desired. I remember going to the toilet and just crying in the cubicle. My mental health was at an all time low and I made the decision to leave the place as my state of mind is more important than any salary. I lasted there for a month and did a few odd jobs here and there afterwards so that I could still get my hours. Unfortunately for me I was badly behind in terms of hours and was not even halfway through the required amount in July. This, coupled with the fact that I was off to Tanzania late August, caused me to fret a bit. Not only were my hours not there, I was also finding it hard to do the placement assignment as I had not been at a steady place in order to get the required documents that I needed. Towards the end of the year however things got a lot better and I got a short-term job that bolstered the hours I had. I was still in a deficit however and I was wondering what would happen when I got back to uni. I'm so grateful to God that I was able to complete my placement assignment and even ended up getting a first in it despite how patchy the year was. When I did get back I found out that due to my shortage of hours I had the option of either writing a long report or continuing in part time employment in order to bridge the gap. I was not up for the report so I opted to continue work whilst studying. I had tried (unsuccessfully) to see if my previous hours from working during my gap year with a hospitality agency could be used and one lecturer had said a flat out no. I continued to try and still work at the same time which was a real struggle during final year. Thankfully, I had gotten the go ahead that it was fine for the hours to be used but I still had to wait for it to be officially approved in January 2018. If it wasn't approved it would mean that I could not graduate this year and would have to wait until much later which is not what I wanted at all. I kept praying, hoping and trusting God that it would all work out. I finally accrued the necessary hours just in time for the January cut off point and I got the clearance that I needed shortly after. My final term at uni was challenging but for other reasons such as the loss of a loved one. I was so tempted to ask for an extension but I knew that I would eventually still have to do the assignment so I decided to press ahead. It was hard but I thank God for seeing me through! And so here I am, done with uni. What's next? If I knew I would tell you though I do have quite a few things to look forward to. I have however decided to take my life a day at a time and not compare my life to that of anyone else because we are all unique in our own way. Some days I absolutely ace this mentality and other days I cave under the age old habit of comparison but the former is taking over which is good. I do want to take this time to thank my friends and girls for being the best support system ever; those that started the journey with me, those I met along the way and those who weren't able to see me complete the journey. I really do look forward to and am expectant of what the next chapter of my life will bring. As always, I'll be sure to fill you all in along the journey (where possible) and not just the destination because we all need encouragement along the way in this thing called life.